LANGKAWI: Mica deal delayed, yet again. The government will not signed the contract for the MBDA MICA surface to air missiles at LIMA 2019. The contract for the missiles meant for the six LCS is unlikely to be signed until the proposed boycott on palm oil by the EU is scrapped, I was told. A mock-up of the VL MICA . As Malaysian Defence reported previously the LCS builder, Boustead Naval Shipyard had already signed the contract for the launchers with MBDA. The multi-layered capabilities of the LCS. RMN graphics. The deal for the missiles must be signed between the governments of Malaysia and France, however. This is the same for the Kongsberg NSM deal. Unfortunately, the MICA deal, was delayed due to various reasons and negotiations were continuing until this year. Negotiations, I was told, was cancelled as it was apparent that the palm oil ban may well be enforced. A CGI of the LCS, a 3100 tonne Gowind frigate. 42 Responses to "Mica Deal Delayed"
So does this mean goodbye to any large french deals from now on? Any plan b for this? I have been told that they looking at a few things but the problem is that the MICA has been baked into the LCS so it will be more costly to put in something comparable. bought the launchers but no missiles to fire.hmm should put aside differences and sort it out.i hope there would be win win situation.otherwise might as well sell those ships to other country or barter them for something similar..if all fails…just load them with coconuts…all the best RMN. What type and model of launcher that had been purchased? Other than MICA, are there any alternative SAM that is compatible with the launcher? If the launcher deal is for the SYLVER, it can be used to launch CAMM. The government is hoping that France will use its influence within the EU to cancel or ease off the ban. Not easy as even if France wishes to do so; there are internal EU politics at play and France has its own interests to watch out for. Whilst we may stop buying EU stuff, we will still have to buy spares for the many EU stuff we already operate, that’s a situation we can’t escape from. It’s a question of who suffers more in the long run and who will be the first to back down. If it continues, the MAF will suffer if we make flawed decisions by buying stuff (stuff that might not suit our specific requirements and stuff we normally wouldn’t buy) as alternatives to buying EU. MBDA incidentally is partly British owned. Well BAE Systems and companies from Russia, China and Pakistan are certainly hoping this happens. A bit early days however.We’ll just have to wait and see how things stand months from now. We still have a very healthy order of Airbuses and getting healthier with the 737 fiasco. So nope. We still do business when it suits us. Otherwise its just another political upmanship. Expect our glorious Government to back down with their tail between the legs. There could be items from UK that would fulfil our needs, but is there any interesting stuff from BAE to fulfil any of our requirements for now? LCA/FLIT? Nothing. Hawks are too weak for many such as the recent USA T-X competition. MRSS? No models in its range that is suitable. There are many hostile voices on the net condemning the decision of Tun M regarding palm oil that delays the Mica buy. Say there is 2 traders, samat and francois. One selling cooking oil, another selling toys. If francois is badmouthing and boycotting samat’s cooking oil, putting samat’s lifelihood at risk, do you think samat should happily buy francois’ toys? Is samat the person to blame for francois boycott and badmouthing of his cooking oil? Yet some thinks samad is to blame for all of this. This is the kind of skewered reasoning some have on this matter. There no way we can win against those Europeans but neither do we should be bullied. I urge all Malaysian 2 eat 1 spoon of palm oil everyday as suggested by our tiger of Asia gov. Who knows maybe we also can get a billionaire son. Ekekeke. No need to do that lah. Everyday makan your breakfast roti with margarine is enough, also made from palm oil. Palm oil is our bread and butter (literally), and just rolling over and still buying weapons while france is boycotting palm oil is not what a self-respecting country should do. Well, here it is, we don’t want to be friends with anybody, so just swallow this pill and go without missiles lah. When you think and reflect of the price of pride and “independence”, remember to include this. If they started with ESSM then I don’t see how Malaysia can boycott the USA. Then this launcher without missles story will never happen. Not that I prefer russian, but I am hoping for MH17 closure before any major deals to be done. Mica does not have separate launchers on its own. Its storage box can be used as a launcher, or it can be put into SYLVER launchers. CAMM operates similarly. If we did buy a launcher, it should be SYLVER. If the previous contract is just for the MICA wiring, then it actually doesnt have a launcher per se. 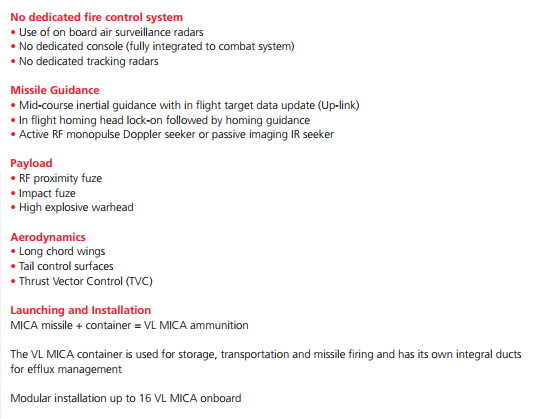 As I said there is no separate special VL MICA launchers. The box that comes with each missile is the launcher. The installation is also minimal, means there is really not much VL MICA specific systems “hardwired” or “baked” into the ship itself. Means it is easy to integrate and easy to remove too. So bring on CAMM! When I say the MICA was baked into the design it is simply that the ship was build to accommodate them wiring piping etc. Yes one can replaced the launchers with another but it will incur more money to do it as the wiring and piping will not be compatible. Yes some still have issues with buying American but this is silly. We train more intensively with the Americans than with anyone else and America is still the dominant regional. The amount may be small but we also receive x amount of cash aid for joint training purposes and to send people for courses in the U.S. We have also benefited by receiving U.S. gear paid for by the American tax payer. On top of that America is a major investor in this country and is recipient of a lot of our exports. Some will say that we shouldn’t be too close to Uncle Sam because of its policy of unconditional support for Israel at the expense of the Palestinians. If we apply this rationale then we also have to downgrade ties with China given its repressive policies in Xinjiang (this will be economic suicude). The irony is that we chose to buy more Fulcrums (Dr. M’s first choice) than Hornets and we ordered the Fulcrums first but the Fulcrums are now retired whilst the Hornets still have years of service left. Those who pushed for ESSM forget that if anyone in the US Government is displeased with us, they can withhold delivery of said missiles. As for going with Russian missiles, they aren’t compatible with the system onboard the Gowind and even if they can be shoehorned, they aren’t likely to work optimally. Its normal to buy the launchers during the construction phase as this will be installed during the manufacturing process. The missiles are only needed for the commissioning phase for test firings etc and also entry into service. Actually we have 4 hulls of the LCS already, of various stage of manufacturing, 1 and 2, completely connected, 3 and 4 still in their blocks. 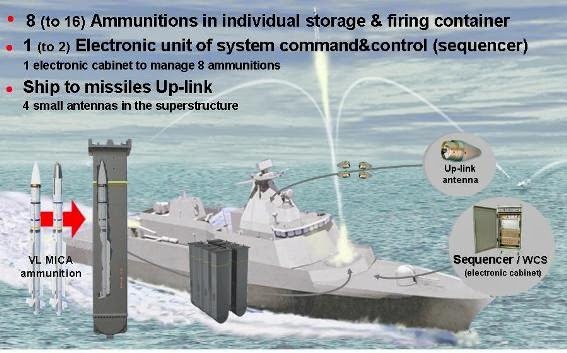 Anyhow, Naval group is only subcontractor for the LCS, everything must go through BNS as they are the main contractor. 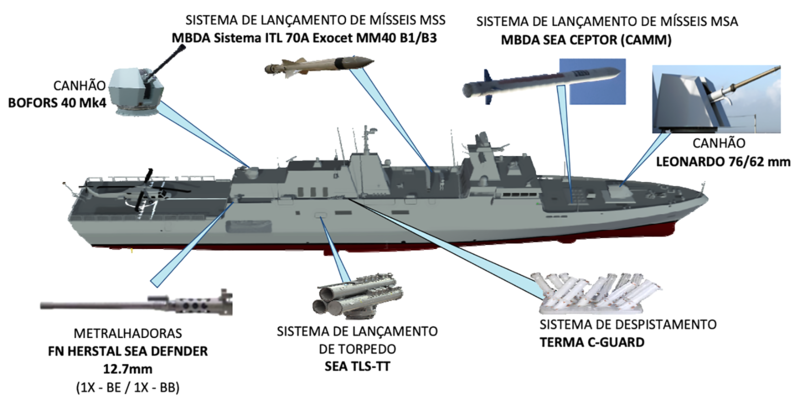 In Brazil, Meko A100 design has won the Brazilian Navy’s Tamandaré-class corvette program. Among the losing bid was the Gowind design. While it is called a corvette, the Brazilian navy needs was for a ship similar in specifications to our SGPV LCS programme whuch we call a frigate. Although called a corvette, the ships will measure 107.2 meters in length and will displace 3,455 tons. The ships will be armed with MBDA sea ceptor (CAMM), MBDA Exocet MM40, oto melara 76mm gun, SEA torpedo launch system and FN Herstal RCWS. From the graphics, the Meko A100 is still with the no exhaust stack design, similar to our Kedah class and germany K130 corvettes. Both operates in closed waters (south china sea and baltic sea) while Brazilian navy operates in the atlantic ocean. So good luck to Brazilian navy and hopefully no serious water ingress will damage its engine. Brazilian Navy’s Tamandaré-class corvette program is for 4 ships with total cost to be not more than USD1.6 billion. So it is quite similar to our Maharajalela SGPV LCS programme. Lets see how both programme compares when completed. The VL MICA deferral is not caused by budgetary reasons. It is because France is banning Palm Oil from its diesel biofuel programme. It can be continued when france retracts the ban, or we can substitute VL MICA with similar missiles not made in france, something like umkhonto from south africa or CAMM from UK comes to mind. To add a little bit more on the Brazilian Navy’s Tamandaré-class corvette. Seems for USD400 million it would not be equipped with a towed VDS Sonar, unlike the Maharajalela-class. It is a ship’s size/displacement and roles that define it as a “frigate”; not its weaponary. A frigate with only guns won’t be a “multi role frigate” but it would still be a “frigate”. Even assuming we could amend the contract and only order 2; there will be ramifications as work has already started and there will be huge compensations which will seriously affect the RMN and taxpayers. Bear in mind the RMN is desperately short of hulls and needs to replace the FACS and Laksamanas. Even after all 6 LCSs and LMSs are commissioned; the RMN will still be overstretched. It’s too early to form any conclusions about the palm oil ban and any knee jerk responses can came back and hit us. A lot can happen in the near future and both sides can make compromises that are mutually acceptable. It’s telling that the EU hasn’t responded to Dr. M’s rhreats however. Well if ESSM is off the menu, CAMM would be a good alternatif. Same range, can be quadpacked in a single VLS cell. But knowing the PM he would be buying British Second Last, French being last. If we want 2 survive the lca contract should be given 2 the Italian. This would bring them on our side. The French alone won’t be enough. Whether d plane suit rmaf is another matter of course. It may be been developed for a RN requirement and may have significant British development input but CAMM like MICA is produced and marketed by MBDA : period/full stop. It would be a silly situation if we refused to buy MICA (because it started out as an all French development for a French requirement under was then known as Matra) but got CAMM because of its British lineage. MBDA is partly British owned and soon Britain won’t be part of the EU; if that helps with CAMM. Unless things have changed with him; the fact that the LCS was designed for MICA and it may enter service without a SAM is the last of Dr. M’s worries. He’s more concerned about the effect of the ban on our economy and the fact that thousands of people in the palm oil industry are voters. As far as he’s concerned the LCS having no SAM is no big thing as were unlikely to go to war and in the event of any tensions; diplomacy will prevent war. Which is why in the past he went for various equipment from a variety off suppliers even though it didn’t suit the MAF and created issues which the MAF is still suffering from; the main consideration was how it would benefit the country in various (non military) ways. Affendi said RMAF had received offers of “private financing” for the LCA programme, but the air force was not seriously considering this. “It’s not that we refuse it, but we are unsure how this private funding will cost us in terms of ‘dollars and cents’. Affendi said RMAF would consider any proposal to enhance its existing LCA system capabilities, adding that any upgrade programme would be dependent on the type of enhancements needed. “Some are major and some just to address the obsolescence issues. so many private $? Russia, China or India? @Azlan you maybe right but I haven’t seen a modern frigate without SAM’s. Even a corvette has them. Lately i have been following this sgpv-lcs project closely & i must say this project trying too hard to immitate RSN Formidable. Usd462 million each seems too expensive. @chua yes i believe the VLS for Mica is Sylver. Umkhonto navalised still green and even shorter range from mica. I saw one guy posted about Indian navy INS Talwar 4000 tonnes export version of Krivak III class cost per unit only at usd400 millions. 6 x 400 = 2.4Billions. Compared to LCS Gowind usd2.8 billions for 6 units. INS Talwar armed with 48 missiles(cruise+sam+rockets). Even the world’s finest frigates Admiral Gorshkov class cost only around usd400-420millions. Weird eh? Their economy is in tatters (just look at their airline Alitalia and it is in deeper s#!t than MAS). They are looking forward to fully join the Chinese B&R and take chinese loans for mega projects in italy. I don’t think italy would help us in any way to take up our palm oils if we take their M346. The major problem here is that in recent times we hardly buy anything Italian and at most we’ll buy 6,8 or 12 platforms. Assuming the Italians had the pull within the EU to reverse or ease back on the ban, would it go out on a limb for us? Would it be worth it’s while to create a rift with its EU partners just to secure a sale of a small number of platforms with a customer that might not make a follow on order and one that sources it big ticket items from others? No doubt there may be certain aspects of the aircraft that we won’t need but at the end of the day; it’s a high end/spec LIFT already selected by Tier 1 air arms so it’s unlikely it wouldn’t suit our needs or be very incompatible with our specific requirements. No doubt what you suggested is an idea but if we’re going to do that, we’ll be better off making some kind of deal with the French. We reportedly threatened to back off from the Scopene deal if MAS was not granted additional landing rights to Paris. This time its different; this palm oil thing is a bigger issue and there’s overall collective agreement (at least on the surface) within the EU. I’m sure there’s back door diplomacy going on and we’ll just have to wait and see how the EU responds. This ban we imposed is also for domestic politics to show that the government is doing something and not just sitting idle (as far back as 1-2 years ago the former Defence Minister spoke of not buying French if a ban was imposed) or it could also be a sign of desperation for not having any other options. IMO, this palm oil issue is irrelevant. If gov want to lift palm oil issue to EU, the gov should talk about airbus not mica. Lets stop buying airbus products. It will rise their intention. Indonesia has expressed their will about buying airbus product if EU ban the palm oil, i think MY should rise the same issue. It is a multi billions dollar issue. It is apple to apple. It is a tricky issue. really. There are companies in Malaysia CTRM and others which had become part of Airbus supplier’s infrastructure. So if we ban Airbus what will happen to this companies? MIDA reported that some RM9 billion were invested in Malaysia in 2018 by aerospace companies. Most of these are EU companies…. Another issue about airbus is most of the buy is by Airasia, not the government. Unless Tony suddenly become very patriotic (not likely as even the airasia HQ was transferred to indonesia) any boycott of airbus is not gonna hurt them. And the option of getting boeing 737 max instead of Airbus 320 neo is a non starter anyway. There is quite a big US footprint in our aerospace industry. ACM and Spirit aerosystems to name a few. No no no, I ‘m not saying that. Sure they are more than willing to sell to us. Trump is more that happy to do so. But I’m saying it can be postponed, delayed or canceled anytime Uncle Sam is displeased with something. Take the US delayed handover of Turkish F-35s, or the pushed back on deliveries of weapons to Saudi, or the block of F-16 spares to Indon, & many more. We might be friends when the contract is signed but who knows what might happen when the times comes for delivery? I’m just saying there is no guarantee the situation would be better if we had went one way or the other. You referring to those elected in or the civil administrators? Every major arms exporter has at one time or the other imposed arms sanctions on clients or used arms sales as an extension of their foreign policy, to their advantage : as not just the U.S; even though it’s the first that comes to mind for many when sanctions are mentioned. Granted, some countries are less likely to impose sanctions then others but the plain fact is that everyone – not just the U.S. – imposes sanctions. Also, quite a number of stuff we buy from non U.S. sources are fitted with U.S. components; components which need U.S. export approval. At the end of the day anybody can impose sanctions and if we did find ourselves under U.S. sanctions we’d be more worried about the economy as the U.S. is a major trading partner. If it was up to the RMAF it would have got Hornets rather than Fulcrums in 1993 and would have got Super Hornets rather than Flankers in 2002. For the Lekiu Batch 2s ESSM was the RMN’s preference. The plain fact is that we’re extremely unlikely to do anything that would result in a U.S. arms ban. People also use to moan about the U.S. not giving object/sources codes and claimed that this is a reason not to but American but the plain fact is nobody freely gives out object/sources codes. What defines a “frigate” or a “destroyer” are it’s displacement and roles it’s supposed to perform. A frigate may enter service not fully fitted out but it’s still a “frigate” by definition of its displacement and roles. The LCS was developed specifically to meet our requirements and was not intended to “imitate” the Fomidables; which BTW are intended mainly for non littoral duties and are an extension of Singapore’s AD network, whilst operating alongside other assets in a networked environment : both classes are intended for different things. My point is, those who pushed for ESSM option should keep this in mind as nobody can predict the future and it doesn’t matter whether if we had chosen the ESSM, MICA, ASTER, or CAMM options. There’s a risk of things going south which can lead to such situations. It just so happens we have an issue with the French stand on palm oil when they had been so receptive in the past. Since we had chosen the MICA path, even getting the launchers which we can’t back out, we should continue further discussions to resolve this issue amicably. A small concession may not be an outright win for us but its better than nothing and we get our missiles. No point we continue to buy from Europe or EU nations if we can not do the trade exchange. Palm oil is our main export commodity and if EU insist to the decision we have no choice to looking another alternative and this is very good lesson. UK will out from EU soon and maybe we can look to the UK instead of the EU and another alternative is to get from Russia not China please. We import not the small amount contract from French for the military hardware two sub and 6 Gowind and we among the early customer for their Gowind and we are among the exocet user, but French so cruel to decide join together with EU to ban the palm oil.